Daily Camera News has published their list of best and recommended lenses for the Sony α6500 mirrorless camera. They have listed their picks for all-in-one, prime, macro, zoom, wide-angle, and telephoto lenses. The Sony α6500 combines the world's fastest AF speed and highest number of AF points with in-camera 5-axis stabilization, 4K video, touchscreen and 24.2MP APS-C Exmor CMOS Sensor. Their pick for the best zoom lenses include the Sony FE 70 - 200mm f/4 G OSS. The small size combined with the versatile 35mm focal length make this lens an ideal companion for the 35mm E-mount body of the Sony α6500. 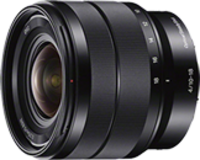 Also see our list of 6 E-mount Sleeper Lenses.